Bake potatoes in microwave until tender. Cut each potato in half lengthwise. Scoop out potatoes, leaving 1/8-inch shell. Mix potato with sour cream and butter. Mash with potato masher. Stir in bacon (reserve a tablespoon or so for sprinkling on top) and 1 1/2 tablespoons chives. Add 1 1/4 cups of the Mozzarella cheese and mix well. Fill potato shells with mixture and sprinkle with remaining cheese and bacon. Place on baking sheet. Bake at 350°F 25 minutes or until hot. Garnish with remaining chives. 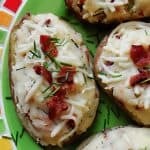 This recipe for Cheesy Bacon & Chive Twice Baked Potatoes was printed from AmandasCookin.com - https://amandascookin.com/cheesy-bacon-chive-twice-baked-potatoes/ and can only be printed for education or personal use.